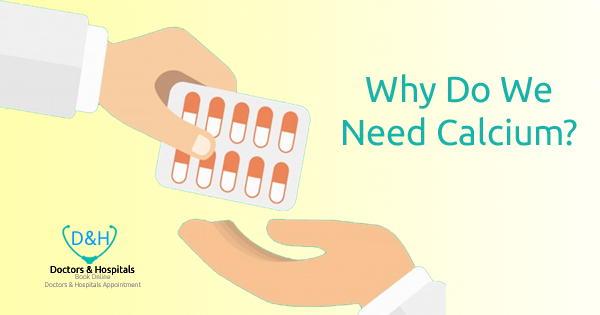 doctorsandhospitals.in > Medical News > Health Tips > Calcium – Why Do We Need Calcium ? Our Food Habits have changed quite a lot due to modern lifestyle. Instead of eating nutritious things, we have started giving more priority to taste, such as junk foods, fried things, cold drinks, chocolate, ice cream etc. Due to disturbance in food, calcium deficiency in the body has become a common problem, which in turn affects the health. Calcium is required at every age for healthy and balanced development of the body. Calcium is also important for the growing body of the body, tooth size and to strengthen the bones. As far as women are concerned, most women of our country lack calcium. In them, the lack of tiredness remains, which remains constant. Since women undergo procedures such as menstruation, menopause, as well as pregnancies and breastfeeding, they typically require calcium. Each cell of the body needs calcium because the body is exposed to some amount of calcium daily through skin, nails, hair and stool. Therefore, to maintain the balance of calcium, it is best served daily. If it does not happen, then our body will start taking calcium from the bones. The result may not be weaker than the outside, but the bones inside will become hollow and the body is weak And weak bones cause many problems, like fracture can occur only after a slight injury. Not only this, calcium is also very important for the heart, muscles, blood clotting. Apart from this, calcium helps in many muscles, such as – Write, jogging, sitting and throwing a ball etc. Calcium is helpful in the message of the nervous system to the brain, such as- if you have touched any hot object, the brain will immediately send a message, so that your mouth will be …! The voice will come and you will see your hand Will quickly remove away. Apart from this, it helps in recovering from injuries, wounds, scratches etc. But if there is a deficiency of calcium in the body, then it has its side effects, which can make us sick. The symptoms of these diseases are gradually exposed. – The elderly may have osteoporosis i.e. fracture and bone pain. Vegetables- carrot, lady beans, tomatoes, cucumber, arabi, radish, fenugreek, bitter gourd and beetroot. Dairy products- The products made from milk and milk are considered as the major source of calcium. Daily consumption of milk is helpful in maintaining the amount of calcium in the body. Mother’s milk- Mother’s milk is the best source of calcium for the newborn, which caters to calcium in them and keeps healthy. All of these are naturally calcium ingredients. These substances are immediately absorbed by the body, by including them in their daily diet, we can avoid calcium deficiencies.